I’m not ashamed of my age: for most of 1979 I was fifteen years old. Living in the suburbs of Atlanta – even then very much a “car city” – I already had my learner’s permit. But one couldn’t drive without a license-carrying adult in the passenger seat, and I didn’t own a car, so I wasn’t yet mobile. But I was determined, and that counted for a lot. In those years, record stores were, seemingly, everywhere. The Turtles chain of record stores (I worked for them in the mid 1980s; it’s some kind of an unwritten rule that music journalists must serve time in a record shop at some point in their lives; what will this new generation do?) had more than fifty – yes, fifty! – retail stores in metro Atlanta alone. But none was within walking distance of my “bedroom community,” Dunwoody, Georgia. There was a Record Bar in Perimeter Mall, the shopping complex a few miles from my house. But that chain wasn’t known for good selection nor competitive prices, so while I’d hang there when my parents went mall shopping, I otherwise avoided it. The coolest record shop I knew of was in Buckhead, then as now a trendy, upscale intown satellite of Atlanta. 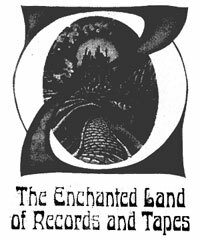 OZ Records was a fairly big store, and they had something that was, as far as I knew then, unique: a used record section. I bought my copies of Beatles VI and Wings at the Speed of Sound from among those racks of lightly-used LPs. Let it Be, too, if I recall correctly (’79 was a very long time ago). Speaking of other stories, OZ was awesome: styling the store in an L. Frank Baum theme, there were even mechanical “flying monkeys” that took your selections up to the front register. How cool was that? Very cool is how cool. I didn’t take drugs, but I’m guessing that for those who did, a, er, trip to OZ was a singular experience. On one of my many visits to OZ, when I reached the sales counter to ring up my purchases, the sales clerk offered me something for free. 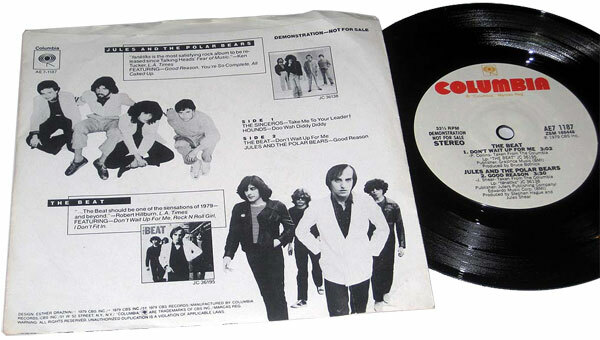 Columbia/CBS had recently pressed a promotional disc, a 7” EP featuring one song each from four groups, none of whom with which I was familiar. But I accepted the disc titled Now Wave Sampler, because, hey, free is free. I took it home and put it on my turntable. Hey, I thought, this is pretty good. For whatever reason, I listened to the second side first; it might well have had to do with the band photos; decide for yourself (see below). The Beat were up first with “Don’t Wait Up for Me.” The Knack had already exploded on the scene, and while I didn’t quite realize it then, this sampler was Columbia’s way of attempting to get in on the action The Knack were generating. 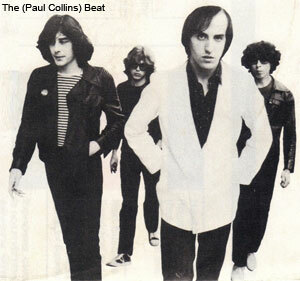 I also didn’t know that The Beat’s leader, Paul Collins, had previously been in The Nerves, who did the original (and I daresay vastly superior) version of “Hanging’ on the Telephone,” covered by Blondie. I found “Don’t Wait Up for Me” very appealing, with an arrangement that made the most of the staccato guitar chording then in vogue, balancing it nicely with some breakout choruses. My favorite thing about the song – and I liked much about it – was an exceedingly fast guitar solo that stopped on a dime (or was edited to sound like it). 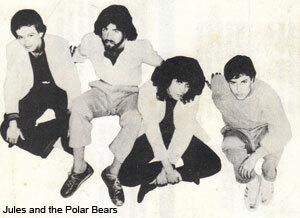 The second song on the first side was “Good Reason” by Jules and the Polar Bears. On first listen, I found the tune strangely subdued, especially coming on the heels of the Who-like raveup of “Don’t Wait Up for Me.” But the tune grew on me, and I began to actually like the weedy vocals of Jules Shear. Even then, I sensed that he wasn’t a very strong vocalist, but he seemed to know his way around a strong pop melody. Of course I had no idea that he’d go on to some minor notoriety as the original host of MTV’s Unplugged. And y’know what? I played Side One of Now Wave Sampler countless times in 1979 and the years that followed. I don’t think I picked up an album by The Beat (later dubbed Paul Collins Beat to differentiate them from a ska-flavored UK group, who’d in turn be labeled [in the USA, at least] The English Beat) or Jules and the Polar Bears until decades later, each found in one of the now-countless used record bins I’ve dug into. One of these days I should probably dig that record out – yes, I still have it and its picture sleeve, both worn but in good shape – and listen again to the (decidedly less memorable) tracks from long-forgotten groups Hounds and The Sinceros that are on the disc’s a-side.